For Devotees of Our Mother God who wish to pray the Rosary Scriptural meditations for the five decades are an essential element of this beautiful Act of Worship. The precise devotion we have in mind here is an adaptation of the Catholic Rosary for those who worship God in Her original feminine Form. You will find all the necessary prayers adapted for Déanic use here. 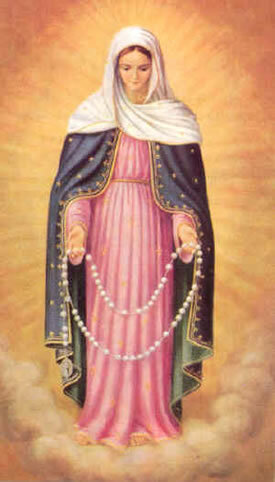 We have already given Rosary Scriptural meditations for the Season of the Nativity of Our Lady. The five sets of Rosary Scriptural meditations that we give here are suitable for use at any time of year, and indeed, quite specifically encompass the whole year. For the number five must always be associated with the five Elements and the five Seasons. These Rosary Scriptural meditations follow the pattern of the Filianic Year, beginning with the Autumn High Feast: the Feast of Divine Life and proceeding through Nativity and Easter to the midsummer High Feast of the Rose of the World: the natural culmination of the Rosary. The year, as manifested in our world, is a microcosm of every cycle of being – from an individual life to a historical cycle to the greatest cycle of all: that of the creation, existence and re-assumption into Dea of the whole of manifestation. These Rosary Scriptural meditations lead our souls into every level of the Cycle, just as the Rosary itself is the cyclical thread whereupon all the worlds of space and events of time are strung. Naturally it is not necessary to use all of these Rosary Scriptural meditations in each Rosary devotion. One may choose from among them and over time we may add more to choose from. It may be asked why the "Rosary year" begins at Autumn while the Déanic and Filianic year begins in Spring with the Resurrection. On one level we might reply that such a beginning would make the Rosary end with the Death of our Lady and Her Death is only the prelude to Her glorious Resurrection. For one thing, this traditional arrangement places Aethyr where it must always be – at the centre of the four material elements. And, perhaps most importantly, you will discover upon praying this Rosary that, arranged in this way, the year forms a narrative – and not simply a narrative but The Narrative. The story of manifestation itself, and of that which lies beyond it: from the creation of the worlds, through their preservation by the birth of the Daughter and their redemption by Her Death and Resurrection, to our final union with our Mother God and the salvation of all beings "even to the last blade of grass", which takes place in the great union of the Rose of the World, for which our precious Rosary devotion is named. Each of these Rosary Scriptural Meditations is intended to help the devotee receive into her heart the five Mysteries of the Rosary and of the world. Just as the Year we live begins, as it should, with the glorious Resurrection of Our Lady and the rebirth of the natural world, so the year we pray – the narrative contained in our Rosary Scriptural meditations – begins as it should, at the beginning of the story of Creation. The whole universe is but the manifestation of the Spirit of Dea. All things, from the vast galaxies to a blade of grass, are Divine Ideas in the Mind of Our Lady infused into material substance. Traditionally "the world" refers both to the particular world we inhabit (the ground beneath our feet and all that stands thereon or flies above it) and the entire cosmos, both physical and non-physical. The world is given to our souls as a place of abode for a little time within the endless vistas of the cosmos. In this first of the Mysteries, we contemplate Our Lady as the Ground of all Being and Creatrix of the Universe; and these Rosary Scriptural meditations are intended to lead our hearts into this contemplation. Let her not trust the ground her feet are set upon and doubt the Ground upon which that ground stands. She hath riven the earth from the Heaven, the Spirit my Mother, and the turbulent waters, hath She not cleft them apart? And the Mistress of All Things was filled with delight, and ran laughing through the forests of the earth. And every peal of Her voice became the image of a golden fragment of Her Spirit. And the trees and rivers were filled with nymphs and every kind of sprite. And all were Her daughters. And Her love for each was inexhaustible, for each was a reflection of some boundless fragment of Her unbounded Spirit. And all their multitude did not exhaust the number of the fragments of Her Spirit. And to each was given the governance of some earthly thing. The world created by Dea was perfect, but maid (by definition, "she who has the power of choice") turned from Dea and fell. She chose by her act to be in that-place-where-Dea-is-not and her eyes could no longer look upon the brightness of the Solar Mother. So Dea must come into that-place-where-Dea-is-not to rescue her fallen children. How could she do that? By separating Herself from Herself, and yet remaining Herself. These Rosary Scriptural meditations help us to realise that Mystery in our hearts. For She had conceived a Daughter that was not separate from Her, but one with Her, and the Child of Her Light. Rejoice poor wanderers of the earth and exiles from the house of your Mother, for to you shall come a Guide and a Deliverer. And when the voice of the Janya ceased, a silence fell that was the first true silence since the beginning of the world, and the last that shall be until it end. And the children of earth watched the sky as the first rays of dawn crept across the heavens. Light has come forth from Light, Perfection from Perfection. And at once the air was filled with the daughters of heaven, and the sky was ablaze with the radiance of their joy. And they sang aloud to the glory of Dea. By her very birth, God the Daughter reconciled Dea and Maid. The Lunar Daughter mediates the Supernal Light of the Solar Mother in a gentle form that even fallen maid may look upon (see the Epiphany of Our Lady). The very existence of the manifest universe in apparent separation from the Mother depends upon the Daughter. And yet while the heart of maid was turned from Dea to the things of Her creation, darkness, death and separation must still exist. With perfect kindness and perfect courage, the Daughter trod the path to the lowest depths of hell, where She met Her death in an Act of perfect atonement (literally at-one-ment), making the way for maid to return to Dea. These Rosary Scriptural meditations open our heart to this Mystery. Now from the time when the Daughter of Heaven had passed through the first gate of Hell, a barrenness had fallen on the earth; and neither bird had sung nor any flower showed its beauty forth; nor was there joy in any heart. But when the Maid was slain upon the pillar of the world, an awful darkness fell on all the earth. 3 And the rivers of the earth ceased to flow, but drained away into the salt sea, and the sea ceased to move, but stood still in awful stagnancy. And there was drouth in all the earth. And neither maid bore child nor ewe brought forth the lamb. And every growing thing began to wither from its roots. And in the nights were neither moon nor stars, and the heat of the sun by day was terrible. With the One Eternal Dea." Thus the glorious Water Mystery of the Resurection prepares the way for the final Fire-and-Rose Mystery of Rosa Mundi. And Her Janyati [Angels] took down the corse of Her Daughter, and laid it upon Her knees; and She wept anew, for none but She could know the awful depth of the oblivion in which Her Daughter lay. And She sprinkled on the corse the water of Life, which She had gathered from the holy tears of Her own sorrow. And Her Daughter rose again and was alive again. And amid tears of joy, They embraced and were One. And after this, the Daughter stood alone. And the souls of the Nether World were awakened by Her gentle light, and followed Her through he shattered gates of Hell. And when they beheld Her, the children of the earth rejoiced, and the rivers flowed again, and the sea began to move. And the children of the earth cried: lift up your voices in song and laughter, for the Princess of the World was dead and is alive again, was broken and is whole; and there is no place whereto Her joyous rule does not extend. Give praise to the Mother of All Things and praise to Her Daughter. Rejoice, for the world is renewed. For I was cast down into the very depths; and even as the tears of My Mother's sorrow raised Me up from death, so shall the tears of My suffering deliver you. As we noted in relation to the previous Mystery, the sacrifice and Resurrection of the Daughter pave the way for maid to return to Perfect Union with Dea. Rosa Mundi, the great Summer Festival of Fire and the Rose marks the Southern Gate of the Year, by which maid may leave the world, just as Nativity marks the Northern gate of the Year, by which Dea enters the world (vide Janua Coeli: the Gates of Heaven). This final Mystery at its highest level, is that of the re-assumption of the worlds into Dea, from Whom they came; and on the personal level, the union of the soul with Our Lady in the Heart of the Mystic Rose. These Rosary Scriptural meditations lead the soul into the heart of this Mystery. Know then your heart and render it to Me; and I shall lead you to the innermost temple of your heart, whose form is the form of a rose. And even as the splendid sun, singing aloud in her brightness, doth shine unto the heights and to the depths, and all the four directions, so doth She govern all that hath come to birth. She that doth unfold all things like to a rose from the seed of Her being; She that doth nurture unto fullness each thing that hath fullness within it; She that doth scatter the colours, 'tis She that doth govern the world. All wounds shall be healed and all ills shall be made good. Those who are poor in the things of the world shall be rich in the gifts of the Spirit. What is partial shall be made whole, and what is dark shall be filled with radiant light. For the Spirit is One, and I am the Spirit. And you are the Spirit also, in the innermost temple of your heart. And She who is the Spirit, My Mother, holds out Her hands to you in happiness beyond all knowing and joy beyond expression of all words. And truly, all sweetness is the far-blown scent of this Sweetness; and all Beauty is the pale and dimmed reflection of this Beauty; and all music but the faint and distant echo of this Music. We pray that these Rosary Scriptural meditations may light your devotion and direct your heart into the precious Mysteries of Our Lady. Know that however much you bring to your Rosary devotion, you will receive far more. May She bless you richly, now and always. Note: more Rosary Scriptural Meditations may be added over time. You may wish to bookmark this page.